An increasing number of caesarean sections are being performed for both elective as well as emergency cases. Category 4 caesarean section refers to a planned elective surgery after 39 weeks of gestation at a time suitable to the mother and the maternity team. For a safe conduct of anaesthesia, the updated obstetric anaesthesia guidelines recommend administration of neuraxial anaesthesia, whenever feasible. The management should include adequate postoperative pain relief, early ambulation, and thromboprophylaxis to ensure early recovery. This review will discuss the anaesthetic management including regional anaesthesia, general anaesthesia, and postoperative analgesia for elective, low-risk (Category 4) caesarean section. Caesarean delivery (CD) is one of the most commonly performed surgical procedures in the obstetric population in developing countries. CD is conducted to improve maternal or foetal outcome, or to reduce anticipated complications from spontaneous labour and vaginal delivery. Based on the World Health Organization (WHO) systematic review, increases in CD rates up to 10–15% at the population level are associated with decreases in maternal, neonatal, and infant mortality. Above this level, increasing the rate of CD is no longer associated with reduced mortality. Analysis of district level household survey-4 (DLHS-4, 2011–12) of India showed that although a higher proportion of women deliver at the public sector, CD births are more in private sector health care facilities. The traditional classification of CD categorised planned CD as an “elective” and all others as emergencies. This system did not adequately address the categorisation of non-elective cases, and hence, all were classed as emergencies. Lucas et al. proposed a new classification that considered the degree of urgency based on maternal or foetal compromise [Table 1]. In 2001, Robson introduced a system of 10 groups that classify all women admitted for delivery (and not indications) according to 5 obstetric characteristics that are routinely collected [Table 2]. Systematic reviews conducted at the WHO identified this classification as the most appropriate system to fulfill current international and local needs. The WHO Statement proposes the use of the Robson classification as the global standard for assessing, monitoring, and comparing CD rates within health-care facilities over time, and between facilities. The Royal College of Obstetricians and Gynaecologists introduced a modified version of the classification proposed by Lucas et al. The color scale incorporated in this classification reinforces the need to recognise that a “continuum of urgency” applies to CD, rather than discrete categories. Category 1 CS is performed where there is immediate threat to the life of the woman or foetus, Category 2, when there is maternal or foetal compromise which is not immediately life-threatening, Category 3, when there is no maternal or foetal compromise but needs early delivery, and Category 4 is delivery timed to suit woman or staff. 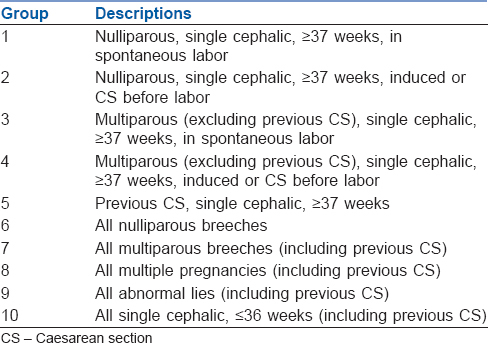 Elective CS is usually planned after 39 weeks of pregnancy to reduce the incidence of transient tachypnoea of the newborn and scheduled at a time suitable to mother and maternity unit [Table 3]. This review will discuss anaesthetic management, including regional anaesthesia, general anaesthesia, and postoperative analgesia for elective, low-risk (Category 4) CD. A preoperative visit establishes trust and confidence in the prospective mother. Most pregnant women are young and healthy; however, the physiological changes of pregnancy make these women prone to rapid and sudden deterioration. According to American Society of Anesthesiologists (ASA), pregnancy is classified as ASA Physical Status II. A neck circumference of ≥40 cm. Institutional difficult airway algorithm should be available. The protocol should be laid down specific to the available resources in that area. The information will be helpful in streamlining the plan of action should an unforeseen emergency occur. An informed written consent for anaesthesia and surgery should be obtained during this visit. WHO has mandated the use of surgical safety checklist for operative procedures in all hospitals. Pulse oximetry is highly recommended along with electrocardiography in this patient population. Blood pressure monitoring is mandatory, preferably using an automated noninvasive device and should be measured every 1–2 min until the delivery of the baby. Capnography is recommended for general anaesthesia during CD to confirm tracheal intubation and maintain normocarbia before delivery. Monitoring devices, such as an oxygen analyser with an audible alarm, carbon dioxide analyser, and a vapour analyser, whenever a volatile anaesthetic is delivered, have also been recommended. Antiseptic technique before regional anaesthesia: Both ASA and American Society of Regional Anesthesia (ASRA) have published guidelines that outline steps to minimise the risk of infection associated with neuraxial anaesthesia. Both recommend using chlorhexidine–alcohol solutions for sterile preparation of the skin rather than povidone–iodine with alcohol or povidone–iodine alone. ASRA guidelines state that “Alcohol-based chlorhexidine antiseptic solutions significantly reduce the likelihood of catheter and site colonization and maximize the rapidity and potency of bactericidal activity when compared to other solutions (Grade A).” Recommendations for aseptic techniques during regional anaesthesia (e.g., cap, sterile gown, sterile gloves, etc.) should be endorsed during neuraxial anaesthesia for CS. Single shot SA is preferred for elective CD, due to its simplicity, ability to provide adequate surgical anaesthesia, ease of administration, faster onset of action, and safety. SA also allows higher maternal satisfaction due to early skin-to-skin contact. The technique of SA is described in [Table 4]. Using combined spinal epidural (CSE) technique doses can be lowered to 5–7.5 mg bupivacaine with or without adjuvants. The block height may then be augmented using aliquots of bupivacaine boluses epidurally. EA causes a delayed onset of the block than SA and the spread of block could be uneven, often resulting in sparing of the sacral roots. The duration of the block can be prolonged if an epidural catheter is inserted, and frequent top-ups with local anaesthetic (LA) agents alone or a combination of such agents and opioids are used., EA offers better cardiovascular stability than single shot SA. The agents used for EA for CD include bupivacaine or lidocaine with 1:200,000 epinephrine. Addition of fentanyl to the LA improves the quality of anaesthesia. Combined Spinal - Epidural (CSE) anaesthesia, especially in elective CS, provides exceptionally good anaesthesia as any patchy analgesia can be taken care of by extending the block with epidural LAs and adjuvants. Compared with EA, CSE provides faster onset of adequate pain relief from the time of injection and increases the incidence of maternal satisfaction. All obstetric operation theaters should have a difficult airway cart. Standard practice for parturients scheduled for CD under general anaesthesia is rapid sequence induction. As functional residual capacity reduces by up to 40% and oxygen consumption increases by 20%, oxygen reserves are rapidly depleted in a pregnant woman. This warrants preoxygenation with 100% oxygen via a tight-fitting mask. Preoxygenation can be achieved by tidal volume breathing for 3 min or by performing eight vital capacity breaths. Difficult mask ventilation (DMV) is anticipated in obese women, preeclamptic oedematous women, and those with short neck. Propofol is now a preferred induction agent for general anaesthesia in CD in healthy, noncompromised patients. However, thiopentone (5 mg/kg lean body weight) and succinylcholine are still the anaesthesia induction agents of choice in developing countries due to ready availability. The combination of rocuronium and sugammadex provides safer neuromuscular blockade than succinylcholine. Remifentanil is being recommended for use in preeclamptic patients to blunt haemodynamic responses before intubation. Robust data are yet awaited to make it a standard practice, particularly in elective scenario. Anaesthesia is generally maintained with inhalational anaesthetic agents such as isoflurane and sevoflurane. Halothane is usually avoided because of its uterine-relaxant activity. Nitrous oxide is also used because of its rapid onset and intraoperative analgesia. End-tidal agent monitoring can be used to titrate the inhalational anaesthetic concentration, with the knowledge that minimum alveolar concentration (MAC) is decreased by up to 40% for parturients. FiO2 should be guided by pulse oximetry. Concentrations of volatile anaesthetics higher than 1 MAC should be avoided throughout the entire anaesthesia for CD before the delivery of the baby due to the transplacental drug transfer and consequent foetal depression, and after the delivery of the baby due to the dose-dependent myometrial relaxing properties of volatile anaesthetics. Supraglottic airway devices are rescue devices that can be used to maintain oxygenation in women with difficult airway, both DMV and/or difficult intubation. The LMA Proseal™ holds great potential in the management of the obstetric airway as it incorporates a gastric tube intended to permit continuity with the gastrointestinal tract and isolation from the airway, minimizing gastric insufflations during positive pressure ventilation. Other supraglottic airway devices, which can be used in similar scenarios, are LMA Classic™, LMA Supreme™, and I-gel™. The efficacy of cricoid pressure (CP) in preventing pulmonary aspiration is controversial, especially as its correct application is much more difficult than expected. The exerted force during CP should be 10 N before the administration of anaesthesia induction agents and should be increased to 30 N after the loss of consciousness. Oxytocin (IV or IM) is the recommended uterotonic drug for the prevention of postpartum haemorrhage PPH in caesarean section by WHO. The Guideline Development Group (GDG) of WHO noted that in terms of blood loss, there was not enough evidence to recommend oxytocin infusion over IV bolus injection. However, due to concerns regarding adverse haemodynamic effects, the GDG considered that if an IV bolus injection is used, a slow injection rate is preferred and a rapid injection rate should be avoided. At low doses of oxytocin, the risk of adverse haemodynamic alterations and nausea are minimised. However, this should be associated with mandatory active observation of the clinical situation, to detect situations that require additional doses of oxytocin or other uterotonic agents. Optimal pain relief is essential following CD as it allows early maternal mobility. A multimodal analgesia regimen which takes into consideration both somatic and visceral “cramping” pain should be practiced. Since most of the CDs are performed under single shot SA without the addition of opioids in our country, relief of postoperative pain is for a limited duration. Pre-emptive analgesic use for pregnant patients is limited by fear of uteroplacental drug transfer. Also, concerns exist regarding the potential for transfer of analgesics to the breast-feeding neonate in postoperative period. 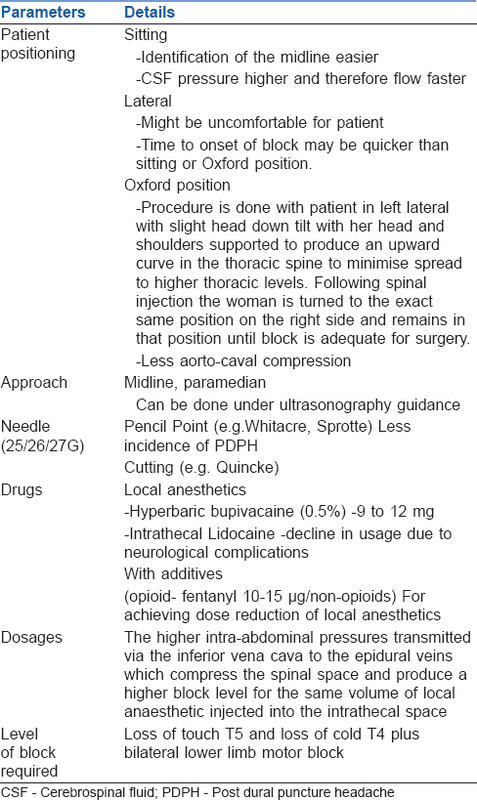 The ASA's Obstetric Anesthesia Practice Guidelines and the American Pain Society's Clinical Practice Guidelines both recommend the routine use of neuraxial anaesthesia for CD., Routinely for intraoperative caesarean anaesthesia, a combination of LA and a lipophilic opioid (e.g., fentanyl) is used. Their analgesia is effective in the early postoperative recovery period until the onset of effect of longer acting neuraxial opioids; neuraxial morphine takes approximately 60–90 min for onset of action. An epidural catheter in situ can be used for continuous and patient-controlled epidural analgesia infusions. The downsides are restricted maternal mobility, increased clinician workload, delayed anticoagulation prophylaxis, and cost-effectiveness. Transversus abdominis plane (TAP) blocks are useful primarily for somatic incisional pain rather than visceral pain. In CDs conducted under general anaesthesia or SA without intrathecal or epidural morphine, TAP blocks have been significantly contributing to improve postoperative pain relief and reduce systemic opioid requirements. Single shot TAP block provides analgesia extending for 6–12 h. Data evaluating quadratus lumborum (QL) block following CD are limited. A study reported reduced opioid requirements and pain scores when QL block was performed after CD under SA. Parturient who undergo general anaesthesia for CD may benefit from LA delivered via wound infiltration or TAP block. However, in patients who receive SA and neuraxial opioids, the benefit of single-dose LA wound infiltration is minimal. Single-dose LA wound infiltration at the time of surgery is unlikely to last beyond the duration of the neuraxial block, affects only incisional (not visceral) pain, and has variable efficacy. Breast-milk transfer potential for commonly used analgesics (e.g., opioids and nonopioids) after CD should be considered. Opioid-sparing multimodal analgesia is generally offered post-CD, because opioids (e.g., morphine) are associated with breast-milk transfer and may cause neonatal sedation. Non Steroidal Anti Inflammatory Drugs (NSAIDs), acetaminophen – These analgesics have opioid sparing property.,, Acetaminophen provides effective analgesia with negligible side effects; hence, it is extensively used in the postoperative period. The US Food and Drug Administration decreased the recommended maximum daily dose of acetaminophen to 3250 mg. NSAIDs are component of multimodal postoperative pain management. NSAIDs decrease visceral cramping pain. Acetaminophen coupled with NSAIDs should be used for post-CD analgesia unless contraindicated. Use of intravenous formulations of these analgesics should be limited to those with intolerance to oral intake or experiencing postoperative nausea or vomiting (PONV). One should recognise the possible causes (e.g., restrictive fluid management) and reconsider the preventive options like prevention of hypotension and fluid administration. There are two further options: (1) prophylaxis of intraoperative nausea and vomiting/PONV occurrence using ondansetron, etc. ; and (2) immediate and adequate treatment using antiemetics. Enhanced Recovery Programme – The majority parturients undergoing CD are young and healthy and therefore have the potential for rapid recovery following CD. Furthermore, being able to care for their newborn motivates them to return to daily activity. The principles of enhanced recovery cover the entire perioperative care pathway – the preoperative, intraoperative, and postoperative phases of care. As anaesthesiologists, we should ensure to use prophylactic antibiotics, thromboprophylaxis, maintaining euvolaemia, prevention of hypotension, active warming for temperature management, adequate postoperative analgesia, and allowing early oral intake as part of Enhanced Recovery After Surgery (ERAS) bundle. Perioperative anaesthesia management for elective, low-risk (Category 4) CD includes through preoperative evaluation, aspiration prophylaxis, proper positioning of patient with left uterine displacement, preference to neuraxial anaesthesia (SA), and optimal postoperative analgesia. Implementation of ERAS programme is coming with a bang. World Health Organization. WHO Statement on Caesarean Section Rates. (WHO/RHR/15.02). Geneva: World Health Organization; 2015. Singh P, Hashmi G, Swain PK. High prevalence of cesarean section births in private sector health facilities- analysis of district level household survey-4 (DLHS-4) of India. BMC Public Health 2018;18:613. Lucas DN, Yentis SM, Kinsella SM, Holdcroft A, May AE, Wee M, et al. Urgency of caesarean section: A new classification. J R Soc Med 2000;93:346-50. Robson MS. Classification of caesarean sections. Fetal Matern Med Rev 2001;12:23-39. Betrán AP, Vindevoghel N, Souza JP, Gülmezoglu AM, Torloni MR. A systematic review of the Robson classification for caesarean section: What works, doesn't work and how to improve it. PLoS One 2014;9:e97769. Royal College of Obstetricians and Gynaecologists and Royal College of Anaesthetists-Classification of Urgency of Caesarean Section – A Continuum of Risk. Good Practice No. 11; April, 2010. Available from: https://www.rcog.org.uk/globalassets/documents/guidelines/goodpractice11classificationofurgency.pdf. [Last accessed on 2018 Aug 10]. Available from: https://www.asahq.org/resources/clinical-information/asa-physical-status-classification-system. [Last accessed on 2018 Jun 23]. Tsen LC. Anesthesia for cesarean delivery. In: Chestnut DH, Wong CA, Tsen LC, Ngan Kee WD, Beilin Y, Mhyre J editors. Chestnut's Obstetric Anesthesia: Principles and Practice. 5th ed. Philadelphia: Elsevier Health Sciences; 2014. p. 545-603. Practice guidelines for Obstetric Anesthesia: An updated report by the American Society of Anesthesiologists task force on Obstetric Anesthesia and the Society for Obstetric Anesthesia and Perinatology. Anesthesiology 2016;124:270-300. Kuczkowski KM, Reisner LS, Benumof JL. Airway problems and new solutions for the obstetric patient. J Clin Anesth 2003;15:552-63. Munnur U, de Boisblanc B, Suresh MS. Airway problems in pregnancy. Crit Care Med 2005;33:S259-68. Committee opinion no 465: Antimicrobial prophylaxis for cesarean delivery: Timing of administration. Obstet Gynecol 2010;116:791-2. Haynes AB, Weiser TG, Berry WR, Lipsitz SR, Breizat AH, Dellinger EP, et al. A surgical safety checklist to reduce morbidity and mortality in a global population. N Engl J Med 2009;360:491-9. American Society of Anesthesiologists Task Force on infectious complications associated with neuraxial techniques. Practice advisory for the prevention, diagnosis, and management of infectious complications associated with neuraxial techniques: A report by the American society of anesthesiologists task force on infectious complications associated with neuraxial techniques. Anesthesiology 2010;112:530-45. Hebl JR. The importance and implications of aseptic techniques during regional anesthesia. Reg Anesth Pain Med 2006;31:311-23. Available from: http://www.e-safe anaesthesia.org/e_library/07/Anaesthesia_for_LSCS_part_2_Regional_TOTW_085_2008.pdf. [Last accessed on 2018 Jun 25]. Sharwood-Smith G, Drummond GB. Hypotension in obstetric spinal anaesthesia: A lesson from pre-eclampsia. Br J Anaesth 2009;102:291-4. Riley ET. Editorial I: Spinal anaesthesia for caesarean delivery: Keep the pressure up and don't spare the vasoconstrictors. Br J Anaesth 2004;92:459-61. Ngan Kee WD, Khaw KS, Ng FF. Comparison of phenylephrine infusion regimens for maintaining maternal blood pressure during spinal anaesthesia for caesarean section. Br J Anaesth 2004;92:469-74. 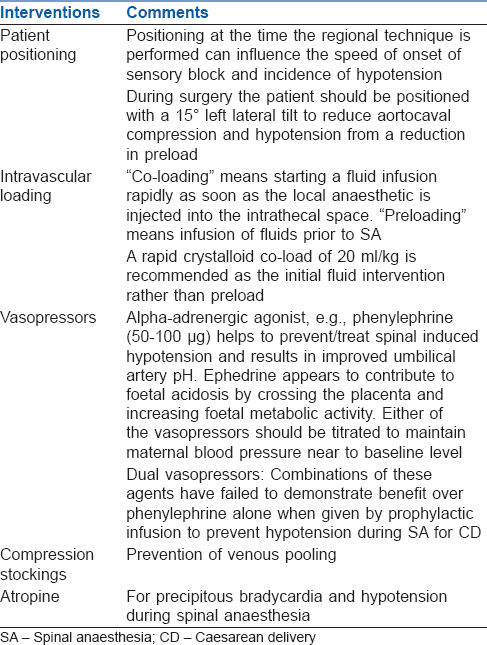 Heesen M, Stewart A, Fernando R. Vasopressors for the treatment of maternal hypotension following spinal anaesthesia for elective caesarean section: Past, present and future. Anaesthesia 2015;70:252-7. Ngan Kee WD, Lee A, Khaw KS, Ng FF, Karmakar MK, Gin T, et al. A randomized double-blinded comparison of phenylephrine and ephedrine infusion combinations to maintain blood pressure during spinal anesthesia for cesarean delivery: The effects on fetal acid-base status and hemodynamic control. Anesth Analg 2008;107:1295-302. Russell GN, Smith CL, Snowdon SL, Bryson TH. Pre-oxygenation and the parturient patient. Anaesthesia 1987;42:346-51. Russell R. Propofol should be the agent of choice for caesarean section under general anaesthesia. Int J Obstet Anesth 2003;12:276-9. McGuigan PJ, Shields MO, McCourt KC. Role of rocuronium and sugammadex in rapid sequence induction in pregnancy. Br J Anaesth 2011;106:418-9. Murdoch H, Scrutton M, Laxton CH. Choice of anaesthetic agents for caesarean section: A UK survey of current practice. Int J Obstet Anesth 2013;22:31-5. Mushambi MC, Kinsella SM, Popat M, Swales H, Ramaswamy KK, Winton AL, et al. Obstetric anaesthetists' association and difficult airway society guidelines for the management of difficult and failed tracheal intubation in obstetrics. Anaesthesia 2015;70:1286-306. Devroe S, Van de Velde M, Rex S. General anesthesia for caesarean section. Curr Opin Anesthesiol 2015;28:240-6. Vanner R. Cricoid pressure. Int J Obstet Anesth 2009;18:103-5.
WHO Recommendations for the Prevention and Treatment of Postpartum Haemorrhage. Available from: http://www.apps.who.int/iris/bitstream/handle/10665/75411/9789241548502_eng.pdf [Last accessed on 2018 Aug 10]. Montgomery A, Hale TW; Academy Of Breastfeeding Medicine. ABM clinical protocol #15: Analgesia and anesthesia for the breastfeeding mother, revised 2012. Breastfeed Med 2012;7:547-53. Chou R, Gordon DB, de Leon-Casasola OA, Rosenberg JM, Bickler S, Brennan T, et al. Management of postoperative pain: A clinical practice guideline from the American Pain Society, the American Society of Regional Anesthesia and pain medicine, and the American Society of Anesthesiologists' Committee on Regional Anesthesia, Executive Committee, and Administrative Council. J Pain 2016;17:131-57. Dahl JB, Jeppesen IS, Jørgensen H, Wetterslev J, Møiniche S. Intraoperative and postoperative analgesic efficacy and adverse effects of intrathecal opioids in patients undergoing cesarean section with spinal anesthesia: A qualitative and quantitative systematic review of randomized controlled trials. Anesthesiology 1999;91:1919-27. Blanco R, Ansari T, Girgis E. Quadratus lumborum block for postoperative pain after caesarean section: A randomised controlled trial. Eur J Anaesthesiol 2015;32:812-8. Lavand'homme PM, Roelants F, Waterloos H, De Kock MF. Postoperative analgesic effects of continuous wound infiltration with diclofenac after elective cesarean delivery. Anesthesiology 2007;106:1220-5. Remy C, Marret E, Bonnet F. Effects of acetaminophen on morphine side-effects and consumption after major surgery: Meta-analysis of randomized controlled trials. Br J Anaesth 2005;94:505-13. Krenzelok EP. The FDA acetaminophen advisory committee meeting – What is the future of acetaminophen in the United States? The perspective of a committee member. Clin Toxicol (Phila) 2009;47:784-9. Ong CK, Seymour RA, Lirk P, Merry AF. Combining paracetamol (acetaminophen) with nonsteroidal antiinflammatory drugs: A qualitative systematic review of analgesic efficacy for acute postoperative pain. Anesth Analg 2010;110:1170-9. Jelting Y, Klein C, Harlander T, Eberhart L, Roewer N, Kranke P, et al. Preventing nausea and vomiting in women undergoing regional anesthesia for cesarean section: Challenges and solutions. Local Reg Anesth 2017;10:83-90. Lucas DN, Gough KL. Enhanced recovery in obstetrics – A new frontier? Int J Obstet Anesth 2013;22:92-5.